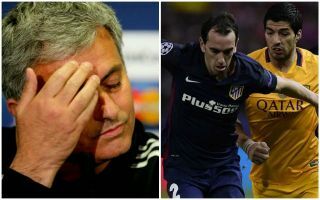 Manchester United were forced to cancel a private jet they arranged to pick up Diego Godin from Spain after being led on by the player’s agent. The Red Devils desperately pursued a centre back in the transfer window over the summer, with high profile defenders such as Yerry Mina, Harry Maguire and Toby Alderweireld all linked with a potential switch to Old Trafford – as per The Independent. United boss Jose Mourinho made no secret of his desire to bring in defensive reinforcements after finishing 19 points behind local rivals Manchester City in the Premier League last season, but he was ultimately unable to add to the solitary signing of Diogo Dalot at the back from FC Porto. According to The Sun, the Portuguese coach was led on a merry chase for one target in particular, as the club chased the deadline day signing of Diego Godin from Atletico Madrid. The Mirror reports that United even arranged for a private jet to pick up the Uruguayan defender, which had to be cancelled after the transfer quickly fell through. The reason for the failed switch was apparently because of misleading information fed to club officials at Old Trafford from Godin’s agent, who initially claimed that the 32-year-old was keen on a move to the Premier League – as per The Sun. However, in the end, it was reasonable to assume that the players representative was merely trying to draw interest in order to earn his client a new lucrative contract in Madrid, which Godin signed shortly after the proposed transfer to United was called off. Mourinho’s men have lost two of their opening four league matches this season, conceding seven goals in the process and how the 55-year-old boss must rue the day he failed to acquire such an experienced and reliable defender after genuinely believing he could secure the deal to improve his squad. I think it is safe to say that Godin’s agent won’t be on his Christmas card list this year!